Inchworms aren't caterpillars of a single species; they are the larvae of many different geometrid moths. Unique among caterpillars, inchworms have three pairs of front legs and either two or three pairs of rear legs, but no legs in the center. When walking, inchworms move their rear legs forward, creating a loop in their middles, and then move their front legs forward. They appear to be taking measurements one inch at a time. Paleacrita vernata, known as the spring cankerworm, and Alsophila pometaria, called the fall cankerworm, are the two most common and damaging inchworms. Paleacrita vernata are reddish to yellowish brown, green or black, with one pale yellow longitudinal stripe on each side, and they have two pairs of rear legs. Alsophila pometaria are light green to black, with three pale yellow longitudinal stripes on each side, singular dark dorsal stripes, and three pairs of rear legs. 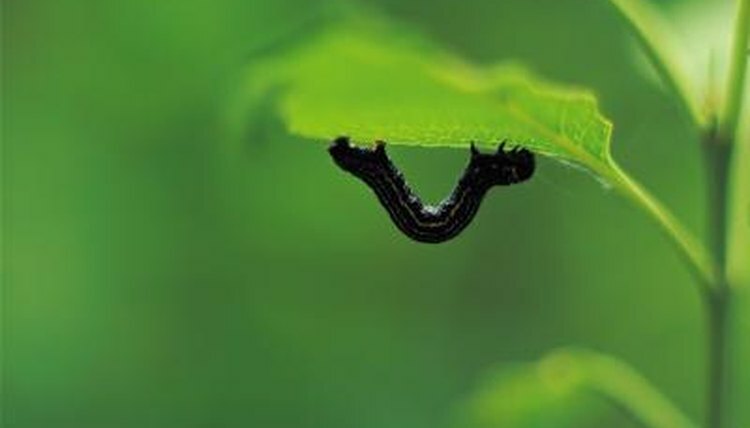 Inchworms are voracious eaters, feeding on deciduous tree leaves, such as ash, box elder, elm and maple. They skeletonize the leaves with their chewing mouthparts, and are capable of defoliating entire groups of trees. Inchworms and their egg masses are a favorite food for foraging chickadees and scrubjays. The egg masses of fall cankerworms are a delicious winter treat for birds. The adult moths breed among the leaf litter below the trees. Spring cankerworms lay their eggs in the spring, and they hatch a few weeks later. Fall cankerworm eggs are laid in the fall, hatching the following spring. Adult females are wingless. After breeding, they climb the trees and lay sticky egg masses on tree branches or in bark crevices. Each egg mass contains about 100 to 250 eggs. After hatching, the young inchworms go through four larval stages, eating almost constantly. After four to six weeks, the larvae drop to the ground on silk strands. They burrow in the soil, creating hibernation chambers where they pupate. Adult Alsophila pometaria emerge when late fall rains and frost occur. Adult Paleacrita vernata emerge in late winter, usually in February.